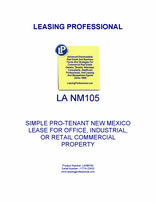 This form is for a single tenant New Mexico lease where the tenant has superior leverage. It gives the tenant the right to use the premises for "any legal use," and has very abbreviated remedies for the landlord in the event of a tenant default. It is also pro-tenant in character because of the clauses it does not contain which customarily appear in pro-landlord forms relating to remedies and a variety of other pro-landlord provisions. New Mexico was acquired by the United States as a result of the Mexican war. Leading the nation in energy research, New Mexico ’s major industries are mining, natural gas, tourism and oil. It is the country’s fifth largest state, but is only the thirty-sixth most populous.